The First Judicial District Commission on Judicial Performance unanimously recommends that Judge Mark Randall BE RETAINED. 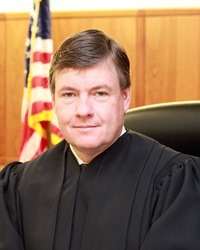 Judge Randall was appointed to the Jefferson County Court in January of 2011. This is Judge Randall’s first performance review since his appointment. Prior to his appointment, Judge Randall served as a Chief Deputy District Attorney and as legislative director for the Colorado District Attorney's Council. He received his undergraduate degree from Creighton University in Nebraska and his J.D. from the University of Denver. His community service activities include serving on the Jefferson County Community Corrections Board, the County Court Judges Association, the District Bar Association, and the Colorado Probation Advisory Committee. Judge Randall is also active in a local rescue organization for abandoned puppies and dogs. Public defenders and district attorneys consistently characterize Judge Randall as fair, thoughtful, polite, and professional. Survey results among attorneys score Judge Randall higher than average in diligence, case management, and case analysis. While a majority of attorneys responding to the survey felt he can be biased towards the prosecution and inconsistent in sentencing, 70% recommended to retain (as compared to 78% for all county judges evaluated during this retention cycle), 14% not to retain, and 15% made no recommendation regarding retention. Among non-attorneys, Judge Randall scores above average in communication, fair and dignified treatment of pro se defendants, and courtroom control. His overall grade from non-attorneys is average, yet 89% of those surveyed recommended to retain (as compared to 86% for all county judges evaluated in this survey), 8% not to retain, and 4% made no recommendation regarding retention. During his personal interview and self-evaluation, Judge Randall articulated a desire to treat each case as “the most important case in the lives of those in front of him” and expressed a strong concern that each case be handled in a fair and respectful manner. He has also exhibited an ability to adapt to an extremely busy docket in the face of administrative challenges, all while maintaining a calm and dignified demeanor inside the courtroom. Based on these findings, the Commission unanimously recommends that Judge Randall BE RETAINED.